Laura Atkins is so honored to be part of such a wonderful opportunity. 13th International ARC Salon Exhibition. 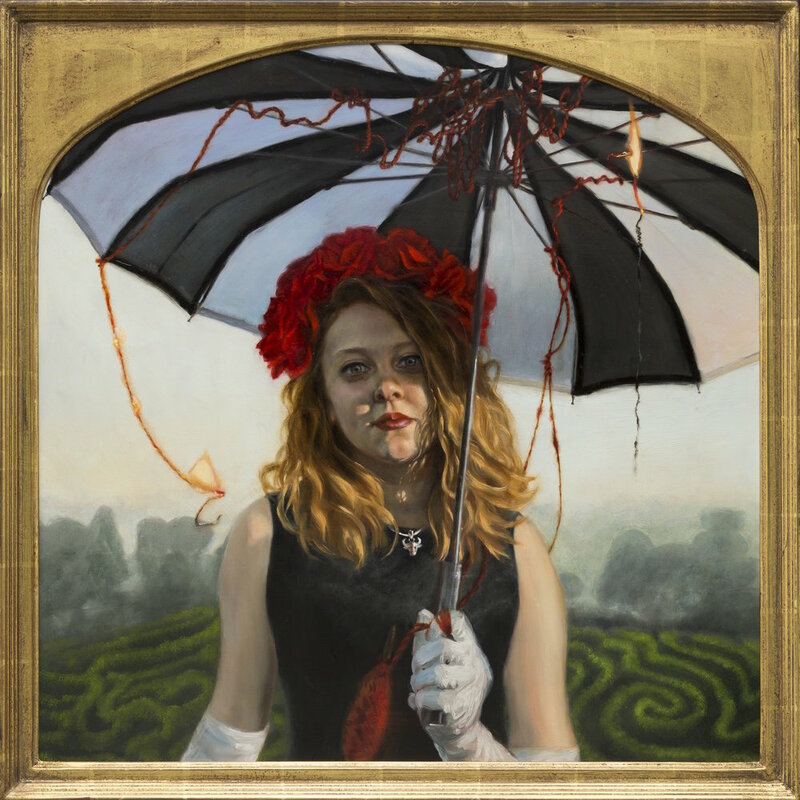 The Art Renewal Center (ARC) is proud to announce the 13th International ARC Salon Exhibition, which will consist of between 75 and 100 Contemporary Realist works selected from over an original 3,750 entries from 69 countries. The most prestigious realist art competition in the Americas and perhaps the world, the International ARC Salon offers over $100,000 in cash awards and international recognition through partnerships with prestigious magazines, galleries, museum exhibitions, and a strong online presence. The ARC Salon Exhibition will be on view at the Following: Salmagundi Club, NY from September 21st—October 2nd, 2018 with the public opening event on Saturday, September 22nd from 11am to 3pm. Entry is free. The exhibition will then travel to Sotheby's, Los Angeles where it will be on view for a two week period between November 6th and December 20th, 2018 (exact dates to be announced). The show will then travel to the MEAM Museum in Barcelona, Spain from February 8th—March 31st, 2019, with the opening event and award ceremony starting at 7pm on February 8th. We are now working on the selection process for the 75 to 100 works joining the show. The list below is an expanding list so please check back regularly to view the newest works being added to the 13th ARC Salon Exhibition. Regular updates and announcements will be made about this exciting event. Annual Midyear Juried Show 2017 Congratulations to Laura Atkins for becoming a finalist . September marks the beginning of the new year for galleries, aka “gallery season”. This September is also Bash’s first September in its new location in Las Vegas, Nevada. With that we are pleased to present 2 new artists to the gallery, Leegan and Laura Atkins. Both are well accomplished in their own styles and we believe their debut appearance will prove to be a “huge” success! All of us at Bash are looking forward to the exhibition. River’s Edge Gallery in downtown Wyandotte will premiere works by artists Laura Atkins, Robby Gall, Birgit Huttemann-Holz and Tim Péwé for “Washes, Wax, Wood & Wishes.” The show marks the beginning of the 2016 season for River’s Edge Gallery. The concept for “Washes, Wax, Wood & Wishes” came from Gallery Director Jeremy Hansen. Hansen had seen works by Laura Atkins and Robby Gall that paid homage to the Baroque period and from his recent travels through Europe and to international art trade shows (including a stop for his own exhibit in Munich, Germany) Jeremy noticed the popularity of this more traditional art genre. Each artist brings a different medium to the show, which is the idea behind the title. Laura Atkins uses a traditional style of painting technique as well as more classic compositions with contemporary elements. “Laura brought in a piece to be framed to ship off to a buyer,” says Hansen. “And we fell in love with it!” Atkins is mostly self-taught and works primarily in oils. Her style is Imaginative Realism. 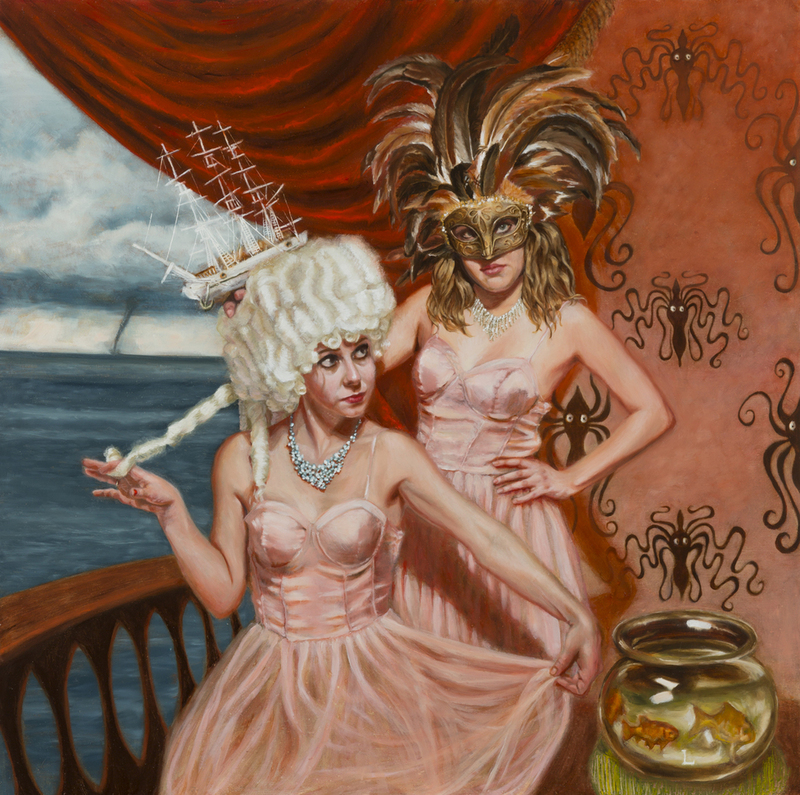 This style uses classical figures pitted against surrealist landscapes and backgrounds. A seascape is juxtaposed against a woman in mid-century garb. Eighteenth century aristocrats are placed against a background with a water spout, a very unlikely pairing. For many women Art can serve as their voice when they want, deserve, and need to speak. We are thrilled to again have an opportunity to provide a venue for these women to share their souls, their hearts, their stories, and their talents. Last year over 250 works were submitted from women around the globe, including artists from Spain, Russia, Mexico, China, Canada, and from across the USA. We look forward to another experience of the incredible energy and affinity created when women are both the subject and the speaker.